The photo of Lemon Grass was taken in late August on the East side of the house. It was planted 6 months earlier and consisted of only a couple of blades. As can be seen, it has established itself rapidly. The plant's most dramatic growth occurs during the hot humid mid summer weather, which is in contrast to its dormancy during the winter. Looking at the photo, one can see 17 inches of growth that occurred in one week, during the middle of August, by noting the terrace where the grass was cut. This plant spent the winter outdoors in a pot unprotected and suffered no noticeable frost damage. Lemon grass is a main ingredient in Thai cooking, herbal teas, and is even slipped into soft drinks and shampoos without you knowing it. Smell it and taste it and you will most likely realize it's an old friend. Furthermore, it is believed by many to be an herbal remedy, helping with stomach problems, arthritis, and containing anti-oxidants. Being a mild sedative, it can also help one to relax. that it stays together in a clump, and because of this behavior it is not substantially invasive. It likes the Phoenix heat and it's watering requirements are similar to those of other grasses. It's growth rate is synchronized with bermuda grass, meaning that it grows slowly in spring and fall, is dormant in the winter, and is most vigorous during July and August. Cut the desired amount of fresh lemon grass into 4 inch pieces. The more lemon grass you use, the stronger the tea will be. Lemon grass is fairly strong so start out conservative. Take the pot off of the burner. Add the lemon grass and cover. The water will turn yellow. Leave the grass in the water until desired strength is reached. Serve like tea with sugar. Southeast Asian cooks use the base of the grass blades in cooking, meaning that the grass blades are more or less uprooted. Lemon grass makes a very good tea and is used in many of the herbal teas on the market. For example, lemon grass is an ingredient in Celestial Seasons Red Zinger. To make tea, one can just trim the plant, rather then cutting it to the base as is done in cooking. Lemon grass is surprisingly strong so it doesn't take a large amount to make a pot of tea. Lemon grass is believed to have medicinal properties and is a mild sedative. Drink a big cup of strong lemon grass tea and you will be ready for a nap. Lemon grass flourishes in the desert heat as long as it has adequate water. It does not scald when provided with afternoon shade. I have not tried to grow it in full sun, so I cannot give any recommendations on this currently. Since the grass goes dormant during the winter it has little chance of being damaged. I am aware of people growing lemon grass in the cooler parts of Tucson, so there are really no worries of freezing in Phoenix. Dig a hole at least twice the size of the rootball. At a minimum, make the hole 2 feet in diameter and 1 foot deep. Work in a 50/50 mix of compost to soil. Be sure to mix the compost and soil as thoroughly as possible. It also is a good idea to finish with the hole an inch or two recessed so that a watering basin is formed. Lemon grass can be more or less treated like bermuda grass except that it should be basin or flood irrigated rather than sprayed with sprinklers due to the fact that it grows in a dense clump and is taller. Lemon grass does well on a grass watering schedule during the summer. Very little water is needed in winter. Use a high nitrogen fertilizer as you would on any other grass. Lemon grass is dormant during the winter and therefore will not need to be fertilized then. It grows slowly and steadily as temperatures warm up and during hot dry times. Hot and humid conditions result in impressive growth rates. Shoots of grass can be dug away from the main clump and planted. 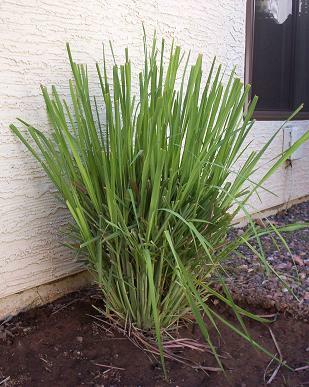 Lemon grass has no significant pest problems in Arizona.